There are indications that two senior Congress leaders, Uttarakhand Chief Minister Harish Rawat and former Chief Minister Vijay Bahuguna, would be fielding their kith and kin in the forthcoming Lok Sabha elections. Urging the voters to be vigilant so that they can vote during the upcoming elections in a free and fair manner, Brig KG Behl (retd), member of the Uttarakhand Election Watch, asked voters not to be influenced by the malpractices practised by the candidates. It will be a battle between Aam Aadmi and royalty in the Tehri parliamentary constituency even as Congress still gropes in the dark to search for its candidate. Due to delay in the announcement of its candidates for the remaining four Lok Sabha seats in the state, the Aam Admi Party seems to have losing momentum in Uttarakhand. Priya Semwal (27), created history by becoming the first Veer Naari of a non-commissioned officer to become Lieutenant in the Indian Army. Barely two years after her husband Naik Amit Sharma, of the 14-Rajput regiment, was killed while taking part in a counter-insurgency operation in Tawang in Arunachal Pradesh, Semwal, mother of a six-year-old, crossed the Antim Pag at the Chennai based officer’s training academy as a young Lieutenant of the Indian Army. A teacher from Kendriya Vidyalaya, Hathibarkala, has filed a complaint in the Dalanwala Police Station against the school principal of molesting her in the school premises. A total of 17 Himalayan Griffon Vultures were found dead near Nadehi village of Jaspur in Terai West Division forest areas of Uttarakhand. Keeping the spirit of festival alive, Uttarakhand Chief Minister Harish Rawat met Uttarakhand Governor Dr Aziz Qureshi at Raj Bhavan and greeted him. 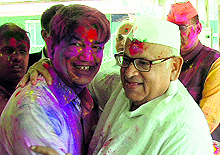 Former Chief Minister Ramesh Pokhriyal and MLA Ganesh Joshi also visited the Governor to greet and play Holi with him. Addressing the gathering, the Governor said the festival of colour gave us the message of unity and brotherhood besides bringing in a fresh enthusiasm to life. A day after the state capital was smeared with gulaal, the city was left stinking, courtesy overflowing garbage bins. A day after manning the state capital to ensure a hassle-free Holi for the revellers, the Uttarakhand police celebrated their famous ''Kapda faad'' Holi here today. Drenched in colour with their shirts either torn off or removed by their colleagues, the force was seen dancing away to the tune of dhol. There was no power cut in Uttarakhand today due to demand and supply of power remaining equal in the state. 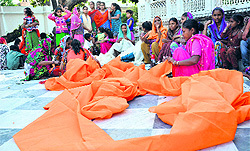 The famous Jhanda mela will commence on March 21. A flag would be hoisted at the Jhanda gate of to mark the 338th birth anniversary of Guru Ram Rai who had founded his dera in 1676. Uttarakhand Jal Vidhyut Nigam Limited (UJVNL) Managing Director JP Patel directed the officials to complete the RMU (Renovation, Modernisation and Upgradation) work at the Pathri Power station by May 31. BHEL will complete the under-construction 120 mw Vyasi Hydropower Project. A day after Holi, rain lashed parts of Uttarakhand during morning hours today. Accused of molesting a woman, the sacked head priest of Badrinath shrine, Keshav Prasad Namboodri, was granted bail by a Delhi court on Tuesday. In a bizarre incident, miscreants today looted Rs 15 lakh from an ATM van when the vehicle was on way to fill currency in one of the machines opposite Ashok Leyland Factory at Rudrapur in Udham Singh Nagar district of Uttarakhand. Post the ceremonial inauguration by local MLA Himesh Kharkwal, 84-day long Purnagiri fair started today. “We have completed all the preparations for the mela and the Tanakpur SDM and mela magistrate Jaswant Singh Rathor has inspected the preparations and okayed it,” claimed Harish Chandra Pargai, chief executive officer of Champawat zila panchayat. The 108 emergency ambulance service received 944 emergency calls on the occasion of Holi, which was 50-70 per cent more than the calls received on an average working day in Uttarakhand. Among the districts, Dehradun topped the charts with 251 emergency calls. Many a local escaped unhurt at Kedarnath and other regions during the major natural disaster that struck last year. This has been linked to the ability of animals to predict natural disaster. Uttarakhand's famed twin mountaineers, Nungshi and Tashi, have entered The Limca Book of World Records for setting two records, a world record for being the first twin sisters to scale Mt Everest, and a national record for being the first twin sisters to climb Mt Kilimanjaro. CS Vishwakarma, general manager of Ordnance Factory in Dehradun inaugurated an exhibition put up at the factory campus here today to celebrate 214th Ordnance Factory Day. A cultural programme marked the annual day celebrations at Government Inter College at Thatyur in Tehri here recently. It is likely that Chief Minister Harish Rawat, who won the 2009 Lok Sabha polls from Haridwar Lok Sabha seat, would field one of his family members as the Congress Party candidate from the seat. With the discussion on the names of party candidates on all the five Lok Sabha seats in the final phases by the party high command, Chief Minister Harish Rawat has argued that entry of family members in politics was inevitable. He said that with greater expectation of the electorate from elected Lok Sabha members, it became humanly impossible to visit each and every corner of the constituency. “One has to bank on the family members to take care of the vast Lok Sabha constituency,” he said. Anupama Rawat, daughter of Harish Rawat, has been taking care of the Haridwar Lok Sabha seat in the absence of her father for the past five years. It is expected that she could be the Congress candidate from Haridwar. Already efforts are on by the Congress leaders of Haridwar district to project her as a consensus candidate. Interestingly, Anand Rawat, younger son of Harish Rawat, is another claimant for the party ticket. Anand Rawat is a former president of the Uttarakhand Youth Congress. Several Youth Congress leaders from Haridwar have demanded that Anand Rawat be given party nomination from Haridwar. According to Congress party sources, even Renuka Rawat, wife of Chief Minister Harish Rawat, could be candidate. She had earlier fought the Almora Lok sabha elections in 2004 but was defeated by Bacchi Singh Rawat of BJP. Chief Minister Harish Rawat has said that fielding his own family members would be his last option. In Tehri Garhwal Lok Sabha seat, it is likely that Saket Bahuguna, son of former Chief Minister Vijay Bahuguna, would be fielded. It was felt in Congress circles that Vijay bahuguna himself would be a strong candidate than his son but the former Chief Minister has reportedly expressed his inability to fight election this time. Saket Bahuguna had fought the 2012 Tehri byelection following the resignation of his father from the seat on his elevation as Chief Minister after the Assembly elections in 2012. In the byelection held in October 2012, Saket Bahuguna lost to Mala Raj Luxmi Shah of BJP. During his tenure as Chief Minister, Vijay Bahuguna did everything possible for the development of Tehri Garhwal parliamentary constituency for his son. He is hoping to encash on several developmental schemes and measures he took for the people of the constituency in favour of his son. He added it was important for the voters to get full information about the qualification and work done by a candidate including criminal records if any, before casting their vote. Instructing the voters to avoid the conveyance provided by the political parties and candidates to ferry them to the voting booths, the member added the Election Commission had tried to set up booths close to every voter’s residence so that they may not have to use such transport. Sprawling Tehri parliamentary constituency in Uttarakhand has been a pocket borough of Tehri royal family since Independence. The family has represented this seat nine times. BJP has yet against reposed faith in its sitting MP Mala Raj Lakshmi Shah, who will be contesting Tehri Lok Sabha seat yet against. BJP MP Mala Raj Laksmi Shah is daughter-in-law of late Tehri king Manvendra Shah of Tehri royal family. On the other hand, new entrant, AAP has announced corporate honcho turned social worker Anoop Nautiyal for this seat. Anup Nautiyal belongs to Dehradun, where the bulk of voters of this constituency come from. Encompassing 22 Assembly segments, the constituency has 6, 75,797 men and 6, 09,274 women voters. Interestingly a large per cent of the urban voters comprise the rich and elite and national phenomenon of rich and elite tilting towards AAP as seen in Delhi assembly elections can be replicated in Tehri constituency. As of BJP candidate and sitting MP Mala Raj Lakshmi Shah defeated her nearest rival Saket Bahuguna of the Congress by more than 50,000 votes in 2012. She had got 2,45,835 votes while Saket Bahuguna got 2,23,141. Interestingly, already on the back foot, Congress is still to announce its candidate for Tehri. Former Chief Minister Vijay Bahuguna, who represented this seat on two occasions, looks little interested in contesting this time; even his son Saket Bahuguna, who lost last time, is least inclined in contesting. An opinion that the sitting MP of doing little on development front has also emerged in recent years. Even late Manvendra Shah was accused of being a dormant MP. ”People are desperately trying looking for an option other than BJP and Congress and certainly AAP fits the bill,” disclosed Rajeev, a Dehradun resident and supporter of Aam Aadmi Party. A clearer picture is expected to emerge after Congress candidate is declared for Tehri Lok Sabha seat. But pollsters are not denying the Tehri election getting triangular this time with the entry of AAP. While the BJP and the Congress have a better organisational network in Uttarakhand, AAP is still to come up with a committed cadre in the state and is mainly banking on its popularity that surged after the Delhi assembly elections success. But delay in announcement of candidates is proving to be a stumbling block for the party looking for a precious seat in the state. AAP so far has only announced candidate for one seat out of five Lok Sabha seats in the state. Harish Arya has been given the party ticket from the Almora-Pithorgarh reserved Lok Sabha seat. But announcement of candidates for rest of four Lok sabha seats-- Pauri, Tehri, Haridwar and Nainital is still to be done. Political analysts say delay in the announcement of AAP candidates can hurt party chances in the elections. Barring Haridwar, rest of the constituencies encompass large hill areas. Thus, in a difficult terrain, it will be difficult for candidates to reach every nook and corner of the constituency before polling take place on May 7. While the Congress and BJP have a established network at the grass root level, which helps them in mobilising their cadres at a short notice. However, senior AAP leader from Uttarakhand Puja Bahukundi, who herself is vying for the party ticket in the state is hopeful of early announcement of candidates. She said AAP across the country was giving tickets to personalities, established names in the society, holding high credibility and thus individual charisma alongwith faith in the party would work in favour of candidates. Bahukundi, who has been associated with AAP's anti-graft movement in Delhi, however, refused to give any time frame for announcement of party candidates for rest of the four Lok Sabha seats in the state. Priya Semwal (27), created history by becoming the first Veer Naari of a non-commissioned officer to become Lieutenant in the Indian Army. Barely two years after her husband Naik Amit Sharma, of the 14-Rajput regiment, was killed while taking part in a counter-insurgency operation in Tawang in Arunachal Pradesh, Semwal, mother of a six-year-old, crossed the Antim Pag at the Chennai based officer’s training academy as a young Lieutenant of the Indian Army. She has been inducted as a Corp of the Electrical and Mechanical Engineering (EME) and would proceed towards Leh as part of her first posting. A post-graduate in Mathematics, Semwal, unlike many other widows, who found solace in the government jobs offered to them by the respective state governments, chose to do something that not only helped fulfill her husband’s dream of serving the nation, but also engrave his name in the history of the country forever. An inspiration for many, Semwal’s life was all rosy until the news of untimely death of her husband shattered everything. Barely 19-year old Semwal married Amit in 2006 while pursuing the first year of B.Sc. It was only after marriage that she completed her post graduation in Mathematics and B.Ed. “My husband always supported me and pushed me to study further. He was the best husband in the entire world. Usually the NCOs wives are not highly educated, but Amit ensured that not only did I completed my post graduation but also become professionally independent. In fact it was at his insistence that I picked up a teaching job in Dehradun while he was posted in Arunachal Pradesh,” recalled Semwal, as tears welled up in her eyes. “For months after Amit’s death, Priya remained in a shell, refusing to speak or meet anyone. In fact at one point of time she was ready to take a rented accommodation so as to stay away from public glare. It was perhaps the worst phase of her life,” said Vishaka Semwal, her mother. “It was due to the efforts of the Commanding Officer of my husband, Col Arun Aggarwal and his wife Jaya Aggarwal that I came out of my depression. They motivated me to join the forces and continue with the tradition my husband had left behind. I was offered a teaching job by the Uttarakhand state government, but I refused it as I never wanted the name of my husband to fade away,” said Lieutenant Semwal, as her daughter Khwaish clung to her. While undergoing the 11-month rigorous training at the academy, Semwal bagged medals for being the best in endurance, best in physical training, best in cross country and best in outdoor training. Speaking about her six-year-old daughter, Semwal said it was the pain of separation that kept me motivated throughout the training period. “Khwaish is very understanding. In fact she used to motivate me whenever I used to call her from the academy. She is very mature as compared to her age,” Semwal added. A teacher from Kendriya Vidyalaya, Hathibarkala, has filed a complaint in the Dalanwala Police Station against the school principal of molesting her in the school premises. According to the complainant, the principal, Ashok Kumar Maurya, molested her a number of times along with obscene comments. She also claimed that she had complained to the school management about the principal’s conduct, but she was made to compromise under pressure from the management. The complainant added the situation was back to square one, when she returned, as the principal started making obscene comments again. Meanwhile, the police have started the investigation in the case and might question the school principal in connection with the complaint against him. Terai West Divisional Forest Officer Rahul said the villagers informed them that a few vultures were lying near Nadehi village of Jaspur with blood oozing out from their mouth. “As we rushed to the spot, we found that a total of 15 vultures were lying dead in a pool of blood,” said Rahul. The other 5 injured vultures were taken for the treatment immediately to Nainital zoo. Rahul said a body of a buffalo was also lying in the close vicinity. “Some medicine must have been injected to the buffalo during the treatment. After the buffalo died, these vultures must have started feeding on it which resulted in their death,” he added. He said they were trying to investigate the matter. The viscera of the deceased animals were being sent to the Vulture Breeding Centre in Pinjore to know the exact cause of death. It is to be noted that a non-steroid and anti-inflammatory drug, Diclofenac, had earlier been used to treat pain, fever and inflammation in livestock across the country. Diclofenac had been banned in the country for treating animals. Terai West Forest Division falls in the close proximity of Corbett National Park, which has thriving population of vultures. Keeping the spirit of festival alive, Uttarakhand Chief Minister Harish Rawat met Uttarakhand Governor Dr Aziz Qureshi at Raj Bhavan and greeted him. Former Chief Minister Ramesh Pokhriyal and MLA Ganesh Joshi also visited the Governor to greet and play Holi with him. Addressing the gathering, the Governor said the festival of colour gave us the message of unity and brotherhood besides bringing in a fresh enthusiasm to life. Arun Kumar Dhaundiyal, state human rights commission member Hemlata Dhaundiyal and Major PPR Chaudhary also visited Governor Dr Aziz Qureshi at Raj Bhavan. Owing to the severe shortage of sanitation workers, a day after Holi, garbage bins in several localities of the city were not cleared leading to the overflow of garbage. Let alone the slums or interior roads of the city, posh areas such as GMS Road, Rajpur Road, Hathibarkala and Dalanwala, too presented a filthy picture. What worsened the situation was the absence of door-to-door collection vehicles in majority of areas. Speaking about the poor condition of his ward, Bhupendra Singh Kathait from Hathibarkala ward said a lot of garbage had accumulated in the garbage bins of the locality a day before the festival. To add to the situation, Holi being a holiday, garbage bins were overflowing as the sanitation staff was on a holiday. Even on Tuesday, garbage collection vehicles failed to clear the dump causing a lot of inconvenience, he said. Meanwhile, Dr RK Singh, health officer of Dehradun Municipal Corporation (DMC), said the backlog of garbage added up during the weekend and made things worse due to a holiday. “Sundays are half-working day for the sanitation workers and Monday was a holiday due to Holi. The garbage backlog mounted up over the last three days and affected the garbage disposal efforts on Tuesday. Our staff tried its best to manage the situation and things will normalise in a day or so,” added the health officer. A day after manning the state capital to ensure a hassle-free Holi for the revellers, the Uttarakhand police celebrated their famous ''Kapda faad'' Holi here today. Drenched in colour with their shirts either torn off or removed by their colleagues, the force was seen dancing away to the tune of dhol. The police stations were virtually turned into a colour zone with nobody visiting the station being spared of the gulaal. Following the instructions from the higher officials, the police force celebrated the Holi a day after the festival. After performing the duties on the day of festival and ensuring that no untoward incident took place to spoil the fun of the festival, the police celebrated the festival with a relaxed mode. However, the semi-naked police personnel, many of who had ventured out of their police stations and come on the road, had left the onlookers embarrassed beyond words. In fact many of the ''dare-devils'' were even pulled up by their superiors to maintain a decorum while celebrating the festival. Uttarakhand’s total power availability yesterday stood at 22.56 million units of power against total demand of 22.56 million units of power. Gurpreet Singh of Dumana village in Ropar (Punjab) had been bestowed with the honour of tying the plumed Darshani cover on the 94 feet long wooden staff that would be hoisted at the Darshani gate. These covers hold religious sanctity and the devotees from all across the world make advance bookings for the Darshani cover that ends up covering the outer most part of the staff. This is followed by twenty satan covers and several hundred plan muslin cloth covers. The stitching of the covers started at the Darbar Sahib which would go on for the remaining two days. The ceremony of removing the old covers would begin on March 21 at 8 am and the new covers would be covered before the flag hoisting. The Jhanda mela will continue till April 8. JP Patel and Sanjay Mittal, general manager of UJVNL, visited Pathri Hydro Power Station and directed for timely completion of the RMU work. Patel was informed by the officals that the RMU work for machine number: 3 had been completed. The officials also informed that the machine number: 3 was earlier generating 4 mega watt of power and after the RMU it was generating 7 mega watt of power. Patel was also informed that the RMU works for machine 1 and 2 was being done speedily. He also directed to ensure that the RMU work for machine number: 1 was completed by April 15 and the RMU work for machine number: 2 was completed by May 31. JP Patel, MD, Uttarkhand Jal Vidhyut Nigam Limited, said the department was committed to completing the construction of the power project well in time. He added besides generating power, the Vyasi project would also cater to irrigation and drinking water needs of Himachal Pradesh, Haryana, Rajasthan, Delhi and Uttar Pradesh. After a dry Holi, the weather took a turn today with rain lashing parts of the state during morning hours today. Some of higher reaches of the state, Badrinath, Kedarnath, Ukhimath and Mukteshwar, experienced heavy snowfall apart from rain in the plain areas of the state. Hailstorms were also experienced in plain areas of the state. According to Met officials in Dehradun, the weather is expected to become clearer in the state by tomorrow. They disclosed that rain took place in parts of the state. However, rain resulted in a dip in the mercury levels. It also led to destruction of crops. The bail came nearly two weeks after he was denied a bail by the court on March 5 . While dismissing the bail application at that time the Metropolitan Magistrate Shreya Arora Mehta had said that the allegations against Namboodri were of serious nature and if released on bail, he may try to influence the witnesses in the case. Earlier the court had granted bail to his associate Vishnu Prasad, a co-accused in the case, while asking him not to leave the national Capital without intimation. It may be recalled that Namboodri was arrested for allegedly confining and molesting a woman in a hotel in Delhi. In the incident which took place on February 3, the victim was called by Namboodri at his hotel room in the night. Upon reaching the room, a drunk Namboodri allegedly molested the victim. Following his arrest, Namboodri was removed from the chair of head priest by the by the Badrinath Kedarnath Temple Committee and a four-member committee set up to conduct an enquiry into the incident. A tradition that is believed to have been started by Adi Shankaracharya, the head priest or Mukhya Rawal at Badrinath shrine, is always a Namboodri Brahmin from Kerala. Deputed for a period of six months from April to November, when the temple remains open, the Rawal is brought to the temple on a special request from the state government. According to police sources, Bageshwar resident Manoj, 27, son of Ram Prasad, along with Ganesh Prasad and Pradeep Kumar, along with cash van, UP 15 AT 7224, reached ICICI Bank ATM opposite Ashok Leyland Factory during 12 noon to fill the currency in the ATM in Rudrapur town. As they reached the ATM, two unidentified miscreants attacked the vehicle. Manoj and Ganesh were seriously injured in the firing done by miscreants. The miscreants subsequently entered the vehicle and decamped with Rs 15 lakh cash. On getting information of the incident, Sidcul chowkie police rushed to the scene of the incident. The injured Manoj was rushed to the hospital where he was declared brought dead. The condition of Ganesh Prasad was stated to be serious. Uttarakhand police are searching for the miscreants. The mela that is being held at Godess Purnagiri temple, which is situated at a hill top near Tanakpur town of Champawat district, witnesses over 7 lakh pilgrims every year since the '80s when it gained momentum. “Legend has it that Goddess Sati's navel, fell at this peak when Lord Shiva was carrying the dead body of the Goddess,” said Prakash Tiwari, a temple priest. Scientists and other agencies concerned might be on the road to developing a fail-safe early warning system which might save countless lives. Many mule owners have claimed that while ferrying pilgrims from Gaurikund to Kedarnath, they were saved owing to abrupt change in the behaviour of animals. Man Bahadur from Nepal, recounting the tale of horror during the natural calamity that wreaked havoc last year, said while he was ferrying a pilgrim back to Gaurikund from Kedarnath, his mule was suddenly startled and steadfastly refused to move ahead. This was a departure from its usual behaviour in the face of all efforts to make the animal move forward. While he was pondering over the animal's behaviour, the mountain just 15 metres ahead started to collapse, leading him to infer that the ability of the mule to predict disaster had saved many lives that day. There are many like him who would testify to having come across similar behaviour of the animals during the disaster last year. Some labourers working in the area also claimed that dogs began to howl prior to the disaster that struck in Kedarnath. The pastor of the church in Mussoorie is of the view that the possibility of such interventions is confirmed in the Bible too. There are several testimonies to this phenomenon around the globe making headlines, suggesting that animals have a sense that helps them escape natural disasters like earthquakes, Tsunamis, volcanic eruptions, hurricanes, tornadoes, landslides, forest fires and super storms, most striking without sufficient warning. Senior citizen and former naval officer Hugh Gantzer says a saying in the Navy — Rats are the first to leave the sinking ship — has something to do with their ability to interpret the cracks developing at the bottom of the ship as signs of disaster. Expert from Wildlife Institute of India Dehradun Dr Vibhash said there were accounts of odd animal behaviour just prior to the Indian Ocean tsunami. Domestic animals fled, dogs refused to go outdoors and flamingoes abandoned their low-lying breeding grounds. He further said a 2,400-year-old ancient Greek document observed animals including snakes and rats abandoning the city of Helike before an earthquake destroyed it. Among domestic animals, there are reports of hens not laying eggs, cows not giving milk, or bees abandoning hives days, hours and even minutes before tornadoes, hurricanes and earthquakes. Dr Vibhash attributes odd animal behaviour to radical changes in the earth's magnetic field that interfere with migratory birds' and sea mammals' ability to navigate. These changes are upsetting to animals. It is believed that many animals can detect certain natural signals, such as shaking of the earth, long before humans. This means they have opportunity to react before humans can. Dr Vibhash believes that detailed study of animal behaviour could help develop a natural disaster warning system. The announcement was made during the recent launch of the 25th records, focusing on empowering women, held at New Delhi to mark the International Women's Day. ''My daughters were especially delighted as this happened before they went on to scale Mt Carstensz Pyramid in Papua, Indonesia, the fifth summit as part of their mission ''2 for 7'' to become world's first twin sisters to step on top of the tallest peaks in each continent. If successful, Nungshi and Tashi will set seven world records in mountaineering at a young age of 23,'' he added. Before proceeding to scale Mt Carstensz Pyramid, the twin sisters had scaled South America-based arduous Mt Aconcagua, christened as ''Death Mountain'' owing to its difficult terrain and extreme climatic condition. At a towering 4,884 metre, Puncak Jaya Carstensz Pyramid, as it is called, is the highest summit of Mount Carstenz Pyramid in the Sudirman Range of the western central highlands of Papua province in Indonesia. The sisters intend to cover the remaining two summits, Mount McKinley or Denali, the highest mountain peak in North America, and Vinson Massif, the highest mountain of Antarctica, by the end of this year. Vishwakarma greeted the employees for their contribution towards the production and supply of quality products. He said the factory was working to equip country’s armed forces with modern defence and battle field equipments. He said the Ordnance Factory was working continuously to modernise its production facilities. The messages of the Union Defence Minister, the Union Minister of State for Defence, the Union Defence Secretary, the Director General of Ordnance Factories and the Chairman of the Ordnance Factory Board, Kolkata, were read out on the occasion. Earlier, Vishwakarma flagged off a run from the administration gate of the factory. It was followed by flag hosting ceremony in the campus. Brig HK Tiwari was also present on the occasion. A cultural programme was held at the community centre. Former Indian Administrative Services officer Nirmal Kumar, Justice Satendar Kumar Jain (retired) and former Bharatiya Janata Party Cabinet minister Khajan Das jointly inaugurated the function with the lighting of the traditional lamp. Students' union president Lakshmi Badhani mesmerised the audience by her traditional Garhwali folk songs. School Principal Satya Pal Singh read out the annual report and highlighted the achievements of the school. Nirmal Kumar exhorted the students to work in the interest of society through their good social deeds and try to become good citizens. Meritorious students were honoured with awards and citations on the occasion. Patel was also informed that the Renovation, Modernisation and Upgradation works for machine 1 and 2 was being done speedily. He directed to ensure that the RMU work for machine number: 1 was completed by April 15 and the Renovation, Modernisation and Upgradation work for machine number: 2 was completed by May 31.